Treatment of advanced periodontal disease is a multi-step process. 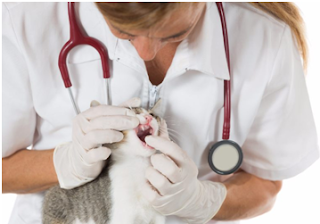 The term Comprehensive Oral Health Assessment and Treatment has been adopted by most veterinary dentists to describe the complexity of Periodontal Disease Diagnostics and Treatment. For hemostasis of soft tissue, the Partially Rectified Radiowave Radiosurgery waveform is chosen. It must be remembered that this waveform produces increased lateral heat and tissue shrinkage. It should not be used for coagulation in close proximity to bone or when performing osseous surgery. The Ball Shaped, #135, or Pencil Point, #117, electrode tips, [Ellman International], are commonly chosen for this procedure. As veterinary oral surgeons we face "CSI" situations within the oral cavity each and every day of our clinical lives. There is no subjective pain and not always a direct pathway to the pain site. We must use all of our senses, diagnostic tools, and history data from the client-advocate to make a diagnosis and treatment decision. The main diagnostic tool of the oral surgeon is oral radiology1 . Detailed extra and intra oral exams must also be completed to elucidate areas of pathology. Radiowave Radiosurgery is one of the most important and versatile instruments in the field of surgery today. Its numerous usages range from performing surgical incisions to establishing hemostasis. Radiowave radiosurgery offers the advantages of a safe, fast, and efficient incision with a better field of visibility. The pressureless cut of radiosurgery, offers minimal bleeding which often requires no suturing.